Creating Change Through Short Films — Bullies Keep Out! I have written about Joshua M. Ferguson and Florian Halbedl and their amazing work before. These two talented and beautiful souls and BKO supporters are making a mark in short film by directing, producing, and writing some incredible projects that signify hope, change, love, and awareness. They look to fight against discrimination and spread their love of cinema that sends a very strong message. They look to advocate by any means possible, and bringing a personal and in-depth film that viewers can find inspiration and motivation in comes first with the film makers. You can find their last project Whispers of Life info on the BKO site as well; however, this time I am reaching out to you all to check out their latest project titled “Mosaics”. This is going to be another one you will want to be involved with, support, see, and contribute in any way you can. You can follow both Joshua and Florian on Twitter and show your support: @Joshuamferguson and @Florianhalbedl along with the studio @TurbidLakepics and the film @MosaicsFilm. The film was written by Florian and will be directed and produced by both Joshua and Florian. They also have a Facebook page you can like here: https://www.facebook.com/MosaicsFilm. Please also check out their past project at: www.whispersoflife.com. It is definitely something to believe in and want to be a part of, even if it is just sharing the information with your friends. 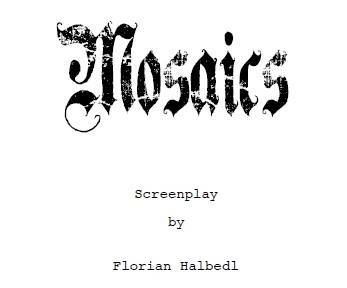 You can find all information on the film and how to contribute along with updates on crew and news and even a short video by Florian and Joshua at www.indiegogo.com/projects/Mosaics. Please consider donating. Any amount helps. It does not have to be a huge donation. If you are a fan of Once Upon a Time or are an Evil Regal, they do have OUAT crew on board.